Bronchoscopy is an important procedure used in most medical ICUs on a very regular basis. 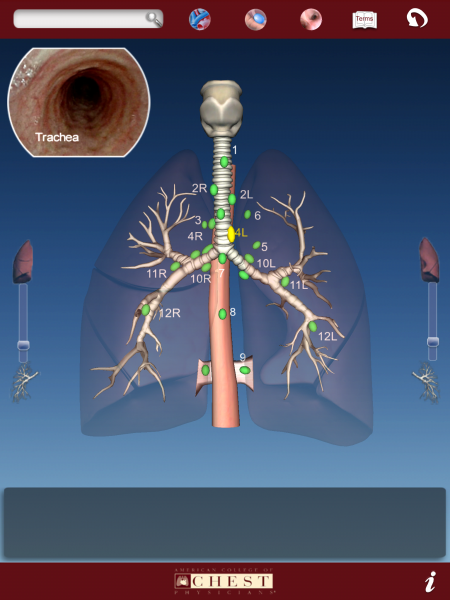 Bronch+ and 3D Bronch are new iPad apps that are designed to help users understand the basic anatomy of the upper and lower respiratory system and how to perform a bronchoscopy. The apps were developed by the American College of Chest Physicians. 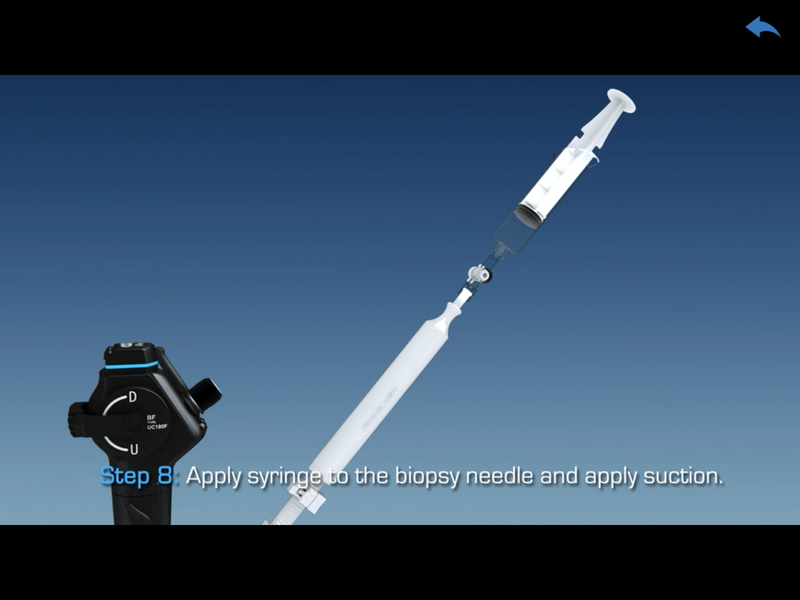 Bronch+ is designed to show users how to properly perform bronchoscopy while 3D Bronch is designed for the users to better understand the anatomy of the respiratory system. First, Bronch+ has five modules included in the app: Introduction, Thoracic Lymph Node Anatomy, TBNA Techniques, EBUS-TBNA Steps, and Sample Handling. All five modules are videos. There are no interactive diagrams in this app. 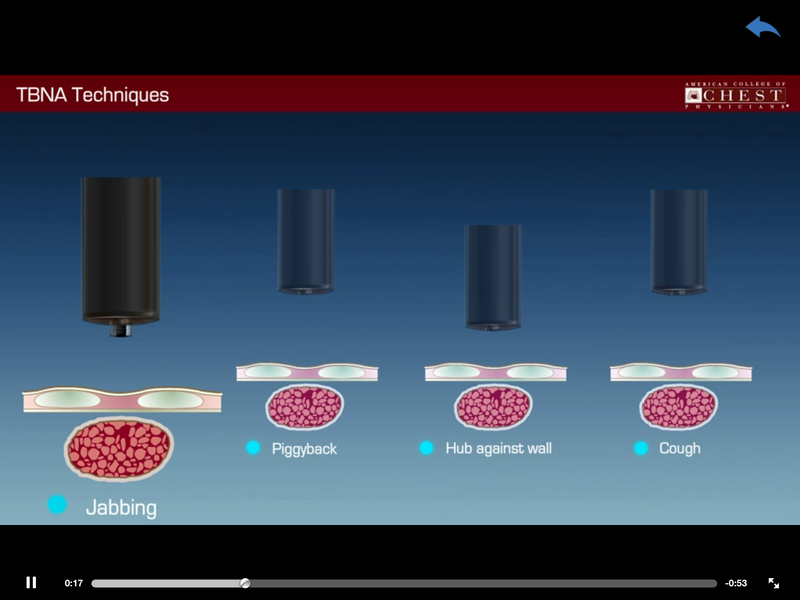 The TBNA (Transbronchial Needle Aspiration) techniques module shows how to appropriately operate the bronchoscope. Additionally, the EBUS-TBNA Steps module breaks down the process in simple terms. The app opens with a 3D model of the lungs. 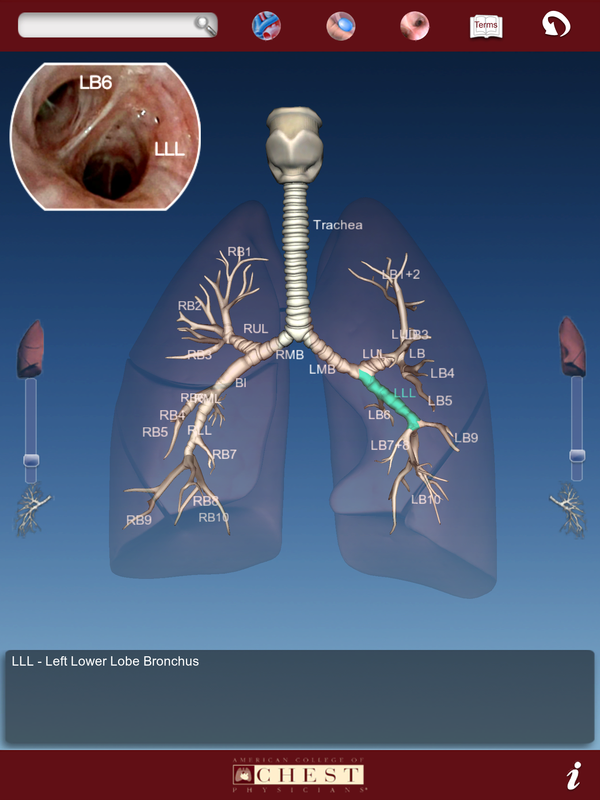 Users can click on the various branches of the bronchial tree to learn what each anatomical structure looks like during the bronchoscopy. 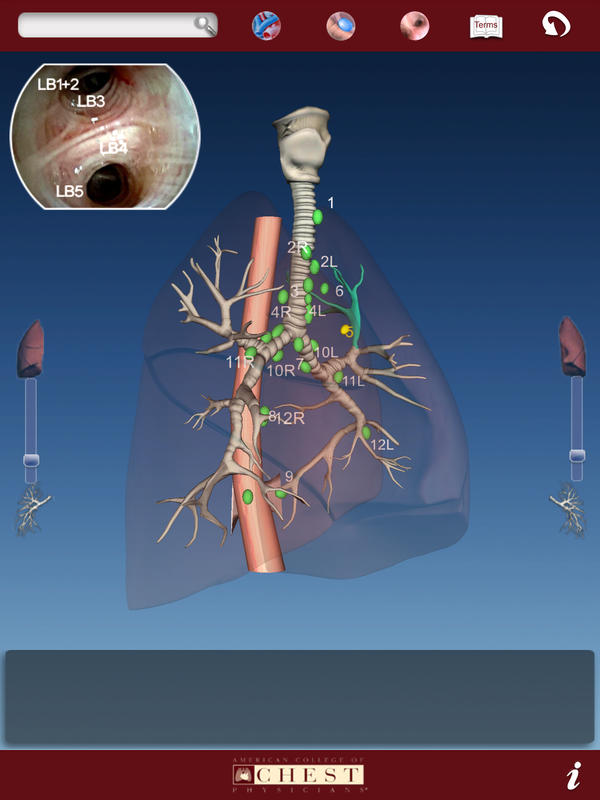 Additionally, the app also has a feature that populates all of the lymph nodes to understand where each lymph node resides in relation to which anatomic structure of the respiratory system. Lastly, the app also has a full bronch image library. The user can slide their finger down the respiratory anatomy model and an image of what the bronchoscopy would show pops up on the left upper corner of the screen. If the user slides continuously, the bronchoscopy image looks like a video of a real bronchoscopy. The 3D Bronch app lagged during every single use during my trial of this app. Transitions between different parts of the app are sluggish. Sometimes, the app would even crash during transitions. User Interface: 2/5 Stars. only 5 videos, no other content. Multimedia Coverage: 3/5 Stars. Bronch+ only has videos and no other content. Price: 2/5 Stars. 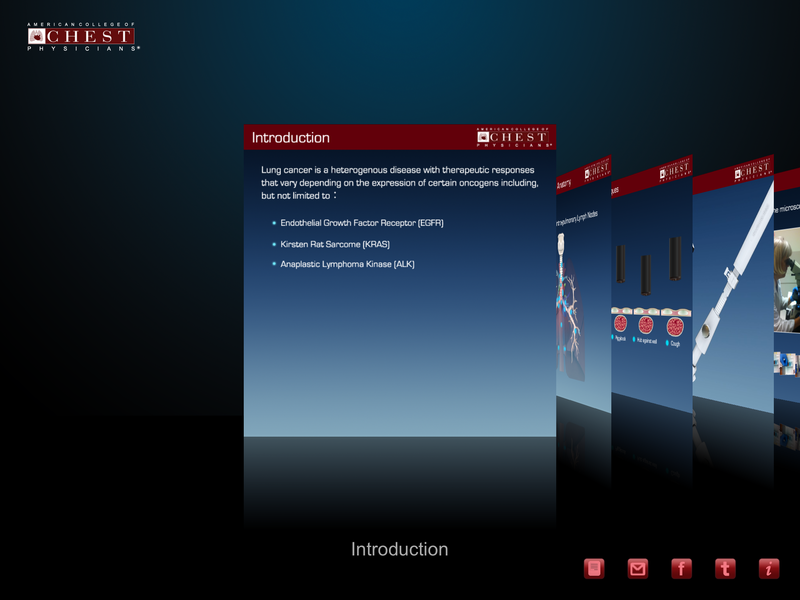 Bronch+ has 5 video modules that don’t even offer CME. YouTube offers videos very similar to this for free (though they are not sponsored by ACCP). Real World Applicability: 3/5 Stars. This is a reference app and will most probably not be used regularly. User Interface: 2/5 Stars. 3D Bronch app crashes and was sluggish during transitions. Multimedia Coverage: 5/5 Stars. 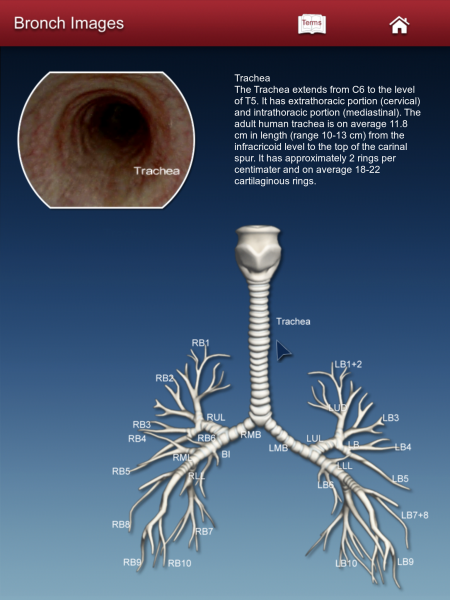 3D Bronch has an excellent 3D interactive model with correlated bronchoscopic images.